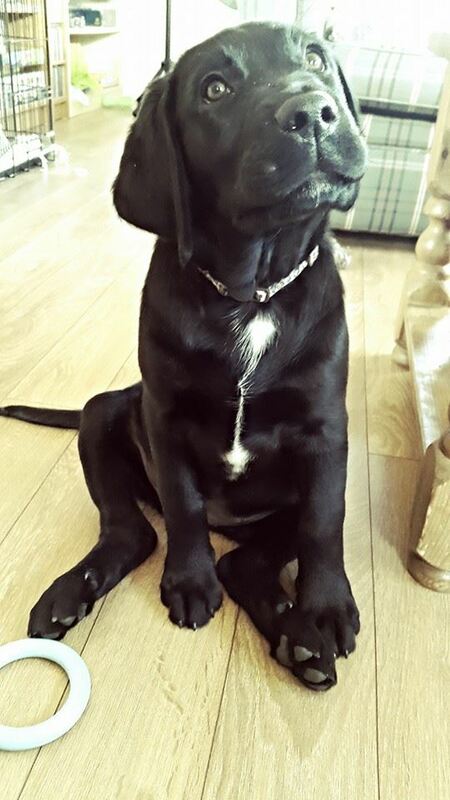 So you’ve picked your pup and soon (s)he’ll arrive, and make a lovely addition to your household! We love our pets (as per my first ever website post), and part of that love comes before we’ve even brought them home – in ensuring we are ready and able to properly care and provide for them. Dogs are a very popular pet; preparing for an adopted adult dog and preparing for a puppy are different things. This post will focus on preparing for a brand new little puppy. Preparation depends a lot on the breed you have chosen – the attributes belonging to the breed of dog you have chosen. Choosing a breed should tie in with your lifestyle – don’t get a breed of dog that requires what you can’t provide. For further information about specific dog breeds, pop me a message or check out my posts covering A-Z of Dog Breeds. Food, Water and the Bowls that hold them! Bowls should be the appropriate size and weight for the breed you have chosen; a large dog breed will require larger, heavier bowls than a small dog breed. If your pup will grow into a tall dog, you may want to invest in bowls that will fit into a stand as your pup grows bigger! A large dog will strong, and move small items (such as food/water bowls) around easily, so heavy duty bowls may be more suitable, to prevent your pup pushing them bowls (and spilling the contents) as they eat/drink. Small dogs are suited to smaller bowls, and medium dogs to medium bowls, etc. The weight of a smaller bowl will depend on the breed – if it’s a stronger/heftier breed (e.g. British Bulldog) you have chosen you may wish to opt for a weightier bowl, than if you have chosen a petite/lightweight breed (e.g. Italian Greyhound). The depth of the bowl should reflect the length of muzzle and shape of the head/face of your chosen breed – a short-snouted dog will struggle to reach the bottom of a deep bowl. You can even get bowls specifically designed to keep long, floppy ears out of the dish and nice and clean! Food will size specific and often age specific, and breed specific too with some brands. Do your research into top brands – don’t compromise with a poor diet for a bargain! There are plenty of top-notch foods out their that won’t break the bank, as well as the ones that will stretch your wallet a bit further! Depending on how quickly the dog breed you have chosen will reach maturity, will determine how long your pup should stay on puppy food – this should be indicated on the packaging (in my opinion, any food brand worth their salt will provide this information). Between 6-18 months old, your dog will have reached sexual maturity (at this point dogs often get neutered), but they may continue to grow to full size for some time after that. Small dogs tend to reach maturity closer to 6 months and are often full grown at 12-18 months; where as larger breeds tend to reach maturity later and can take 2 years to become fully grown. As mentioned above, the breed and size of your dog plays a big factor in getting ready for them. If you plan on crate training your pup (which I personally would recommend) think about the best option – if you plan on keeping the crate throughout your pets adult life, for travel or holidays or “just in case!” (like we did with our family dog) then buy for an adult dog! Don’t buy a little crate for the pup, buy the size you will need in the future to accommodate the size of dog you will have. In my experience, crates don’t tend to differ too significantly in price as the sizes go up, so it’s more advisable to spend a tenner or so more for the correct adult size than end up spending the X amount now and then X+ amount again in the future. Post on Crate Training to follow. Beds – sizing being the obvious factor here, but also take into account where your pup will be sleeping and what characteristics the breeds is known for. 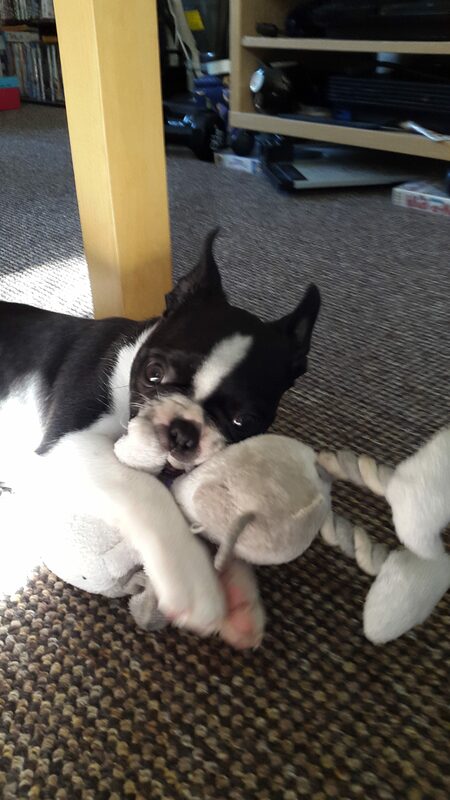 Some breeds are known for chewing through anything – you don’t want your pup chewing their way through nice pillow stuffing that can clog up their gut, just for the sake of wanting them to have a soft bed they can snuggle into. Dogs are brilliant and keeping themselves warm, and you’d be surprised how insulating a lining of newspaper under the bedding can be! The bed and/or crate will be your pet’s “safe space” – this is where teaching children and others comes in. If your dog takes themselves off to their bed and/or crate, do not disturb them or harass them but leave them to it; they need to know this is their space and it is safe for them to have peace from children and from excitement and anything else. You should be able to stroke your pet, to handle them if necessary in their bed – they shouldn’t be possessive of their “safe space” to the extent they may get aggressive. Do stroke your pet in their bed and/or crate but not for long, but often enough so they allow you into their “safe space” when necessary. Get your pup used to a collar – puppy collars are gentle on the new skin and new fur of a young pup. Put the collar on for 5 minutes a day at first, and build up the amount of time over a few weeks. Once your puppy is ready for their first set of vaccinations you can try a collar on for a few hours building up as you see fit until their second set of injections, when you can take them for a walk. 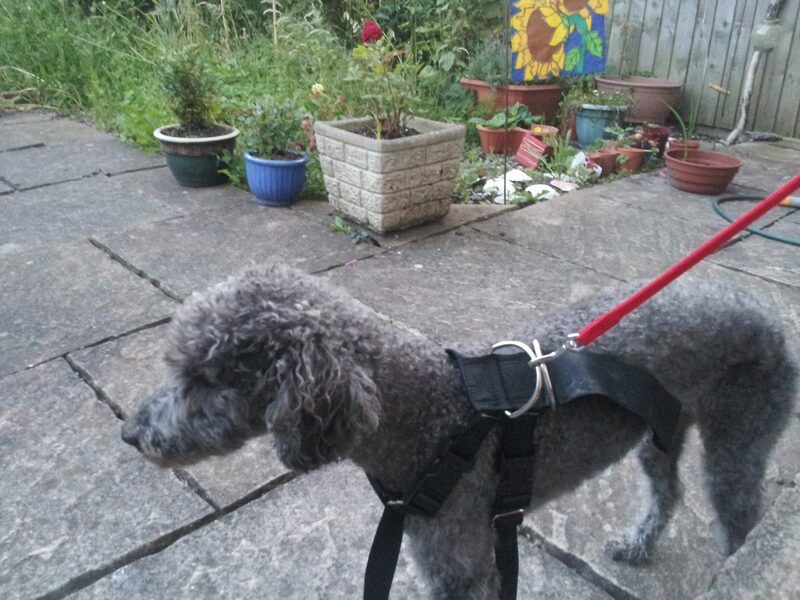 Before they can go out into the big, wide world you can take them around your garden or home on collar and lead (or harness or whatever you will use to walk them). Teaching your pup to walk well on a lead is essential – especially if you plan on walking with just a collar and lead. 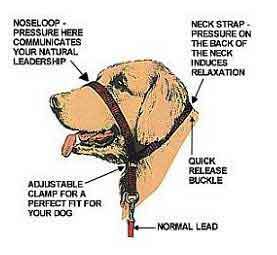 If you plan to use a harness or a gentle leader (personally I’d advise against using a Halti) get them used to this also with the collar and lead. If you do plan to use a harness, do your research and get the best type of harness for your breed – I would advise against a harness that goes round the chest and over the shoulders as this restricts movement; go for a hardness that goes from the chest, around the shoulders. Do not use a harness on breeds designed to pull, as this will encourage pulling. If you plan to use a gentle leader, ensure you fit your pet with the correct size to ensure full control and that your pet will not slip out of it. Alternatives are check chains and half-check chains – I personally would never use a check chain, and certainly if you are unsure how to set it up for safe use as you could choke your pet; half-check chains are a lot safer, as they do not require set up as they are half chain and half collar. I personally do not prefer either but if you insist on one, go with the half-check. Once your pup is big enough for “walkies”, keep walks short and interesting until they’re big enough to walk further an explore more. If you plan to walk your dog off lead in any location, then off the lead training should be done before hand, in a safe area, to ensure your dog’s safety when out and about off the lead. For further information on the above section check out my Loose the Leash! post. On a related note, for travel in the car I suggest getting a suitable harness or travel seat/carrier. Do not let your dog loose in your car whilst driving – you may have a well behaved dog, but good behaviour won’t stop your dog flying out the windscreen or into a person (or worse) in the event of a crash. My little pooch (pictured below in his car harness) weighs around 10 kg – just imagine the damage 10 kg can do loose in a car in a crash… safety first, for you and them! Please do check out my other website posts or send me a message via any of my contact details below for further information on any of the above, or advice for walking equipment and/or on and off the lead training. (Car) Harness – note straps go around the shoulders, not across. All images are WordPress supplied, open source Google images, or my own – or photos donated for use.